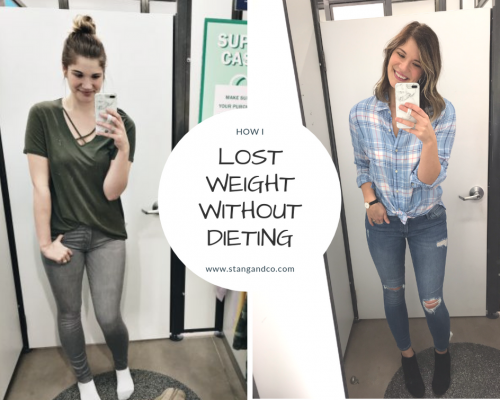 Lose Weight Without Dieting: How I Lost Over 10 Pounds! Raise your hand if you have ever taken on a new diet in hopes of losing weight. If we were sitting in an auditorium, I bet every. single. hand. would have just shot up in the air. We live in a world that is oversaturated with new diets, workouts, and supplements. Every day I see a post selling a product, a workout, or a book that promises quick, easy results. Trust me, I have bought into them. Weight is a touchy subject, and it is something that every adult is conscious of in one way or another. There is one problem with all of the fads out there; they aren’t made to last. While shakes and strict plans may help you kick start new habits, they usually aren’t sustainable. And that is why today I want to talk about how to lose weight without dieting. I have been lucky enough to never struggle too much with my weight. 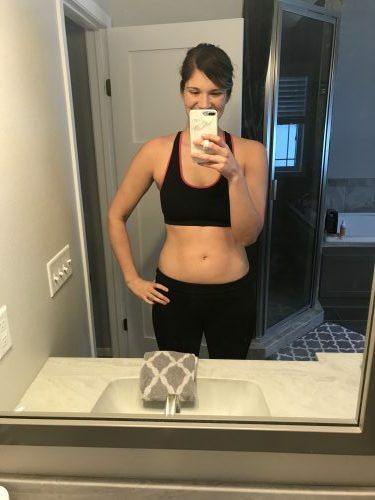 The ‘Freshman 15’ struck me my first year in college, but I managed to take it all off, and hung out at a consistent weight up until my first pregnancy without too much thought. I have always liked to work out. However, pizza, dessert, and wine coolers were a regular part of my 20-something diet. Once I became pregnant, I gained a very healthy amount of weight, and dropped it nearly immediately both times through breastfeeding. I made SO MUCH milk, that no matter how badly I ate, I was able to maintain a healthy weight. It wasn’t until I quit breastfeeding that I noticed weight creeping on. From the time I fully weaned Lincoln, I gained five pounds practically overnight. 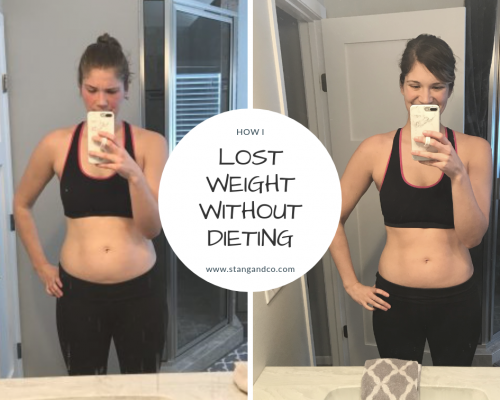 I hadn’t changed anything, but I was no longer burning hundreds of calories a day by nursing. Then the holidays came, followed by the longest winter we have ever had. All in all, I gained nearly 15 pounds. It crept on gradually, so I barely noticed it until I tried on my shorts after a winter hibernation. To the naked eye, I pretty much looked the same. But I felt terrible, and knew I had to make some changes. These photos were taken at my ‘peak weight’. They have been hiding on my computer for nearly a year, and I never originally thought I would share them. However, the thing with weight gain, especially with it is not drastic, is you can hide it. I didn’t wear skin tight shirts on my belly. I started avoiding tank tops because I felt self conscious about my arms. Your eyes adjust, too. I knew my arms and legs had filled out a bit, but I didn’t notice until I saw the random picture like the one above. I was still technically in the healthy BMI range, although I was creeping towards the top of it. But there is no doubting I was getting ‘thicker’. My motivation to lose the pounds that had crept on was, of course, to a certain extent about how I looked. But more importantly, it was about how I felt. I felt sluggish, I felt bloated, I just felt icky. It was truly the first time in my life I felt unhealthy. Alright, enough of my story. I am sure you are waiting for me to get to the point! When I realized I had extra weight to lose, I told myself one thing: I needed a lifestyle change. As I said above, diets can be great to help you lose weight quickly, but I wanted a sustainable change. I wanted to develop habits that I could carry with me for years to come. It has taken me nearly nine months to take off the weight I gained the year prior. 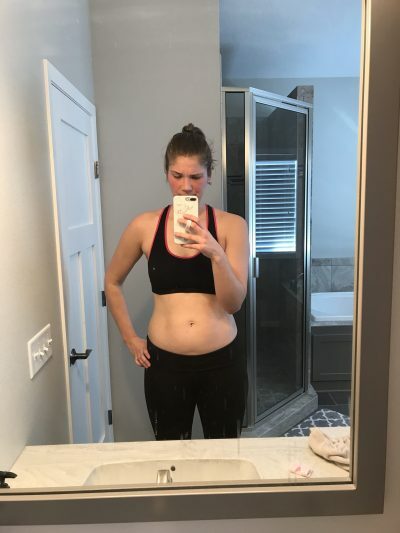 I took these ‘after’ photos this week, and to be honest, I could not be more proud. Like I said, ten or fifteen pounds is relatively easy to hide, but I am not ‘sucking it in’ or strategically posing differently in either photo below. It is the raw, real truth that my body changed this past year, even though it was nothing HUGE. I have not felt this good in my skin in a LONG time! I am officially back at my pre-pregnancy weight, and feel better than I have in ages. And it was truly a trial and error process. Some weeks, I felt like I was doing such a good job, and the scale just wouldn’t budge. It wasn’t until I took the time to understand my body better that the pounds started to come off. 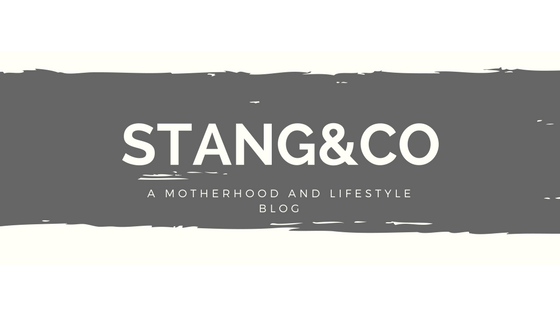 After four years of pregnancy/nursing, it was almost like having to learn about my body and what it needed to be at its healthiest all over again. There is a lot of hype out there surrounding intermittent fasting, but I do not consider it a ‘diet’. I have never been a big breakfast eater, but was constantly being told that breakfast is the most important meal of the day. But intermittent fasting puts a hole in that theory. Again, I am not a nutrition expert and will NEVER make any health claims, but for me, this is the process that works best. Essentially, you do all of your eating within an 8 hour window during the day. So, I usually eat my first meal around noon, and make sure if I do any snacking or eating after dinner, that I am done by 8pm. Cutting off snacking after a certain point at night was one of the biggest factors in helping me lose a few pounds. The process really helped me identify where I was doing the bulk of my ‘unnecessary’ eating’! Speaking of after dinner snacks, I have found this is the BIGGEST thing that derails me whenever I am seeing weight loss progress. No matter how healthy I eat throughout the day, if I end the evening with a big bowl of ice cream or a couple of cookies, I don’t see progress. In part, these foods tend to cause me to retain more water. I always hold myself to the ‘ring test’; If I have to struggle to put on my wedding ring, I have probably had too much sugar/sodium! I do not think I will ever advocate a total elimination diet. Again, that is when a diet becomes a diet, and therefore something that does not have longevity. But I think every person I knows eats way more carbs than they NEED to. We were in a habit of serving carb heavy meals, and often forgot the vegetables entirely. Now, when I make tacos for dinner, I still let my boys have shells, but I skip the tortilla and load up on lettuce, black beans, peppers, and meat. Instead of a shell, I opt for a small amount of tortilla strips or crushed chips. I still eat carbs, but they are not the main component of my meals! This has helped the weight come off, and is also something that seems to affect how much water I retain and how bloated I feel! I have heard SO many people say that they do so well during the week, and derail any progress they have made when the weekend shows up. Here is the thing; I look forward to my weekend wine ALL WEEK, and I am a firm believer that some things in life aren’t worth living without. We love pizza, and we refuse to eliminate it from our diets! But we can have pizza, and then make sure we eat clean the next day. Now, instead of diving into a weekend of unhealthy eating, we plan out any meals we will be eating out for. Or, if we know we have a big family dinner Saturday night, I make sure to eat lighter on Friday and to be extra healthy throughout the day on Saturday. Balance is so important, but it has become so clear to me that eating bad Friday afternoon through Sunday evening is NOT balanced and will make it very hard to live a healthy lifestyle! 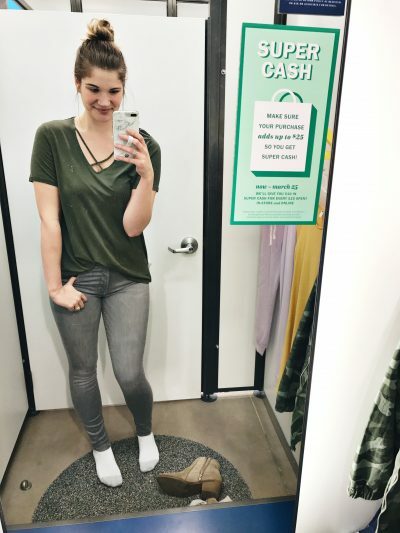 Same dressing room, different body. Totally different confidence level from last year to now! Again, I am NOT a doctor or a dietitian, and you should never embark on a total diet change without talking to them about it first. 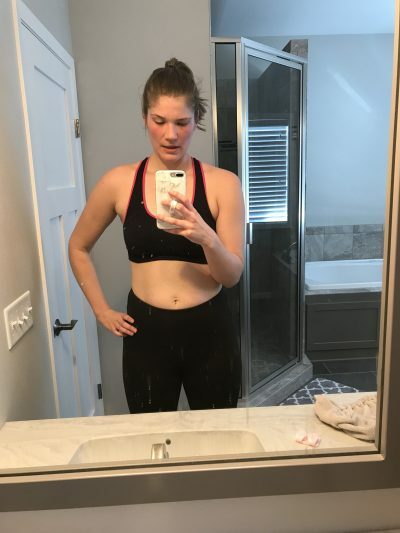 But I wanted to share the changes I made, because it was not a quick results plan. It was a lifestyle change. It was taking the time to learn what my body needs to be nourished, without overindulging. 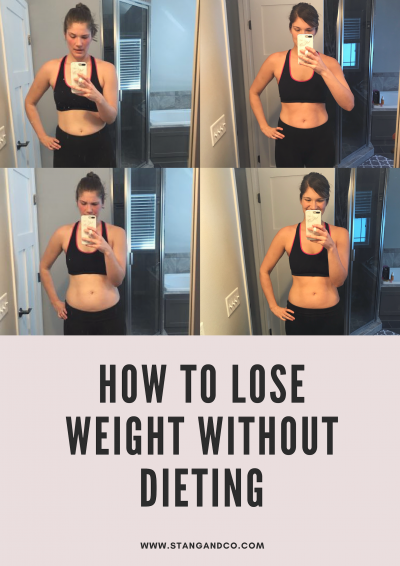 Hopefully some of the methods I used to find that balance will help you, too!